Upstanders Stand Up in Style! Some of the most inspiring efforts to stand up against bullying are sartorial. Students in three high schools in San Francisco’s East Bay towns wore skirts on busses and to schools to show solidarity for an agender senior whose skirt had been lit on fire on the bus. Gang Up for Good’s Mean Stinks campaign has two million girls painting their pinky fingernails blue to show they won’t stand for bullying. And here’s a great story about boys! Young football players, rather than “beating up on the bullies” as tough guys tend to want to do when they’re feeling hurt and upset, dressed up instead to show they were with the target. Way to disengage from the bullying dynamic! Kids at school often bullied Danny — they didn’t understand why he wore a dress shirt or fedora each day, and they didn’t understand why he couldn’t talk. Danny has apraxia of speech, a motor disorder that makes it difficult for him to communicate. Kids would go up to him and ask, “Why can’t you talk? Just talk.” He’d come home from school distraught. But a group of the boys on the Bridgewater Badgers’ football team, where Danny is the official water manager, wouldn’t stand for this. Their solution? A “Danny Appreciation Day,” where they would all imitate Danny’s suave style and proudly go to school. 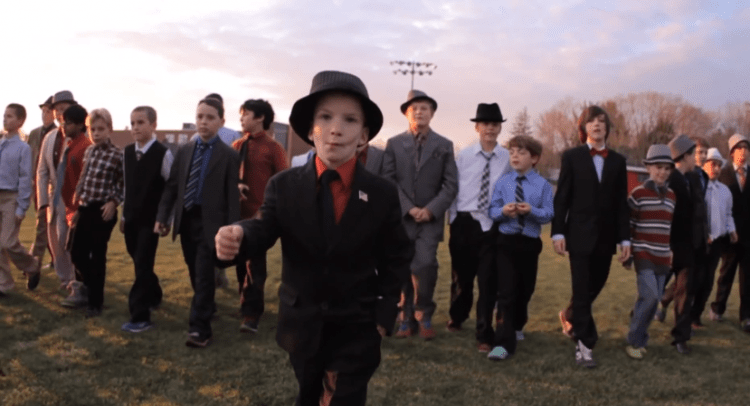 In the Life Is Good video below, you can watch scenes from that day — more than 40 boys wore suits. Danny led the march. via 40 Boys Put on Suits to Stand Up for Their Friend. It Worked. | The Mighty. THE ZORGOS READER is an online companion to The Bullying Antidote: Superpower Your Kids for Life. The ZORGOS READER provides links to the studies, articles, books and blogs that inspired and informed The Bullying Antidote by Dr. Louise Hart and Kristen Caven; discussion questions for each chapter; upcoming author events; and blog posts with more news and resources. For people who are implementing — or thinking about implementing — trauma-informed and resilience-building practices based on ACEs research. Read about it on Oakland Wiki! "A wise and very caring book." "The definitive book on bullying." "This book is the answer." Inspired by the cover photo of the child playing superhero, ZORGOS symbolizes the encompassing power to shift bullying dynamics into caring and kindness, positivity and power. The word Zorgos comes from the Esperanto, "I will take care."